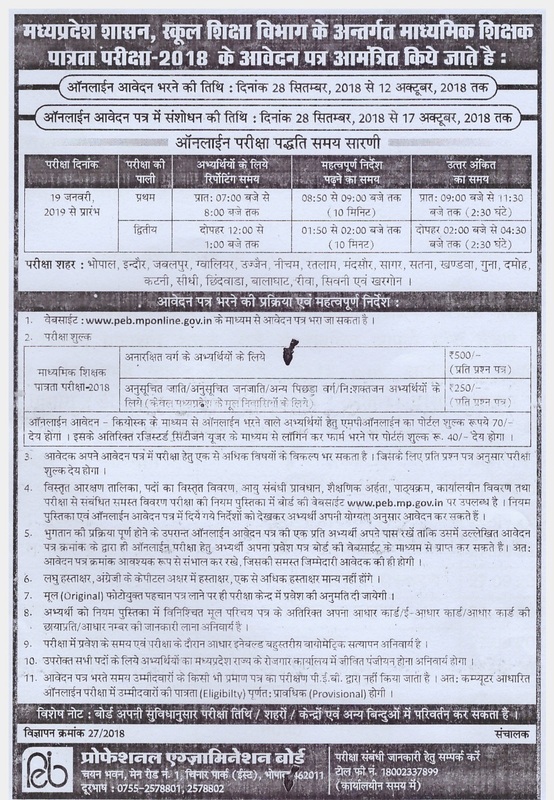 Madhya Pradesh Professional Examination Board is Inviting All Candidate to Fill the Application Form For 5670 Posts of Middle School Teacher. As All of You Know that MPPEB Announced the MP Middle School Teacher Recruitment 2018. All Interested and Eligible Candidate can apply for MP Middle School Teacher Recruitment 2018 from Our Web Portal newjobindia.in. All Candidate Who Wants to Apply for the MP Middle School Teacher Recruitment 2018-19 they Can Apply From 28-Sept-2018 to till 12-October-2018. Bachelor Degree in Primary Subject and two year Diploma in Elementary Education or its equivalent. Candidates Should be Minimum 21 Years Old. For More Details Check Official Notification. Open official Website PEBMP or Direct Link Given By us. Tap on Online Form – Middle School Teacher Eligibility Test – 2018. Submit the Application and Get Print out of Filled Application Form.